One of my true passions is having the honor of teaching workshops in a variety of venues – at retail stores, international trade shows and at art retreats. My role of an educator is to inspire and share my vast knowledge with my students. My teaching philosophy is simple – to give students the knowledge, show and explain techniques and how to use use products, and give hands on experience so that they can create their own masterpieces. Join us May 1st thru 6th 2019 to encounter new experiences, have inspiring conversations and create with like minded creative individuals. Tinker Tailor Artist Maker is the premier event that brings together a creative collective from across the world. Choose from over 60 workshops and events taught by 19 international artists including Seth Apter, Amy Beeman, Jennifer Cahoon, Jen Cushman, Kecia Deveney, Michael deMeng, Madeleine Durham, Dorit Elisha, Vanessa Kiki Johanning, Abby Kojola, Gwen LaFleur, Roann Mathias, Andrea Matus deMeng, Sharon Payne Bolton, Lora Lee Rose, Taska Sanford, Scott Stabile and Amber Young. All of the workshops offered at the event have been created exclusively for this event so although you may have previously attended a workshop from one of the instructors, be sure to see what they’ll be sharing with attendees at the event. I attended my first Art Is You Retreat in the Fall of 2015 and I can honestly say that it was one of the most transformative experiences in my life, both personally and professionally. For the first time, I felt as if I had found my tribe – my eccentric, crazy artistic friends that welcomed me with open arms, encouragement, and paths yet to be discovered. So many doors have opened for me since attending my first Art Is You event. One of the Mentors at Art Is You wrote an article featured on Huffington Post – take a moment to read from a “newbie” why Art Is… Everything. To register for one of my Workshops, simply use the red links below listed under the name of each workshop – this will take you directly to the Tinker Tailor Artist Maker registration pages for each of those workshops. ALL workshop registrations are made directly through the TTAM website. We are much like buildings – behind the exterior lies depth and mystery, built by multiple layers that are slowly built upon. Each layer reveals another part that makes the whole. This Master Workshop has been designed to allow you to work outside of the rules, exploring new techniques and experiences – this is the idea behind revealing your own Façade to the world! Many times we forget that the key to being an artist is to allow our inner voices to speak, to embrace the creative process, and let our work evolve organically and to take on a life of it’s own. You will leave this workshop inspired, with a new confidence and courage to continually evolve as an artist. In this workshop, we will celebrate the freedom to explore new techniques to create a mixed media masterpiece that focuses upon creating texture and color while incorporating found objects and ephemera for building backgrounds and layers. Get your hands dirty while learning how to use a variety of different pastes, gels and paints – with many of these techniques able to be used on a variety of different surfaces. You will also have the opportunity to create some amazing mixed media elements including faux tin-type photos (photos on metal), antique and vintage elements from paper clay, sculptured fabric, working with resin (creating resin paper and bezel embellishments), and the fundamentals to encaustic (wax) techniques. Always wanted to create a statement jewelry piece that’s sure to get noticed? That will definitely happen after completing this stunning bracelet in the Tila Bezel Bracelet workshop! The workshop will begin with you creating your bezel set with resin, which will be the focal point for the rest of your bracelet. While the resin is setting, you will learn how to create this beaded bracelet using the pattern created by the instructor. This pattern uses Delica beads, Swarovski crystals and square Tila beads. This bead pattern can also be created with a bezel for future projects. You will also learn how to use a variety of closures for securing your bracelet. 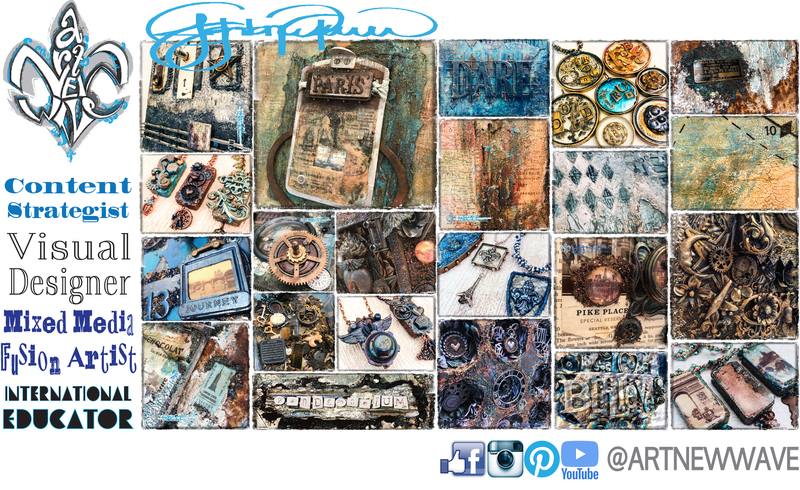 Assemblage takes on a new meaning with Mixed Media Fusion where we’ll throw out all of the rules for creating dimensional and layered masterpieces using your favorite found objects in combination with striking backgrounds of texture and color. You’ll be surrounded by others who have also collected enough found objects to be featured on an episode of Hoarders and need to find a way to start using some of their treasures! This workshop will focus on creating beautiful textured backgrounds using a variety of mediums while slowly adding layers of color and washes. You’ll discover how to properly adhere your embellishments and how to add color and highlights to them as well. Of course we’ll add some collage elements including your favorite ephemera, printed papers and even stencils and rubber stamps. This transformative experience will challenge you to look and think of everyday objects in a completely new way! How many times have you seen a piece of beaded jewelry and thought “I wish I knew how to make that?” Or standing in the bookstore looking at arts and crafts magazines and looked between the pages at beading instructions and became overwhelmed at all of the steps? After taking the Bijou Bling class, YOU CAN MAKE IT!!! Learning how to bead is easier than you think – there are only a handful of foundational bead stitches that create almost any project that you see in a store or in a magazine! This workshop will make beading more approachable, while at the same time teach you some of the foundational beading stitches to begin your journey into creating stunning jewelry. This workshop will begin with the basics and progress into more complex breaded projects. The first project we will create is a wrap bracelet to become comfortable with beading tools, the tension required for beading, and closures. In the workshop we will create a single wrap bracelet which will allow you to make your own multi-strand and/or multiple layered wrap bracelets. The second project to be completed in class is this stunning peyote tube pendent. Peyote stitch is one of the main beading stitches used for making a variety of different projects including bracelets and cabochon wrapping. You will learn two different ways to bead using even count peyote stitch and then quickly create this stunning pendent. The final project to be made in the workshop will be this stunning right angle weave bracelet. Right angle weave is used as the foundation for a variety of different projects because of it’s versatility in not only construction of the basic pattern, but also in the embellishment of filling in the pattern once woven. Everyone’s social media goals are different – what are yours? Are you looking to simply gain new followers, increase impressions and likes, or to drive traffic and sell your fabulous artwork? This workshop is designed to help take your Instagram presence to the next level by introducing you the variety of different tools and techniques to organically grow your Instagram community and establish yourself as and artist on this platform. Whether you’re brand new to Instagram, or you’ve been on the platform for years, this workshop has something to offer for everyone! Although this platform has been around for almost a decade, many people are still apprehensive about joining Instagram or how all of the algorithms actually work. What many people don’t realize is that Instagram has seen year after year growth, especially from people who are looking for an alternative to Facebook. Personally I have placed more of a focus to Instagram over the past couple of years after finding that this platform has resulted in more traffic and sales to my website and in this workshop I’ll share with you what I’ve learned to help you do the same! Success in the realm of social media is like making homemade pasta sauce from scratch – it’s a labor of love, requiring dedication and patience from preparation to letting the sauce simmer until perfection. Just like making pasta sauce, seeing a return on your efforts placed into growing your social media audience and communities takes time but is well worth the investment in the long term! I am a firm believer in creating a social media audience organically over time, meaning that with the right tools and content your growth will happen on it’s own. The reality is that social media growth (despite what people think) does not happen overnight. Similar to planting a garden, your social media presence needs some TLC and cultivation before it blooms and bares fruit. And this workshop will be the seeds for your garden! I have helped individuals to large manufacturers establish and grow their social media presence on a variety of platforms including Facebook, Instagram and Pinterest. With so many different tools available on these social media platforms, sometimes it seems simply overwhelming to know exactly where to start. This workshop has been specifically tailored for artists, focusing on our specific needs that are different from others on Instagram.